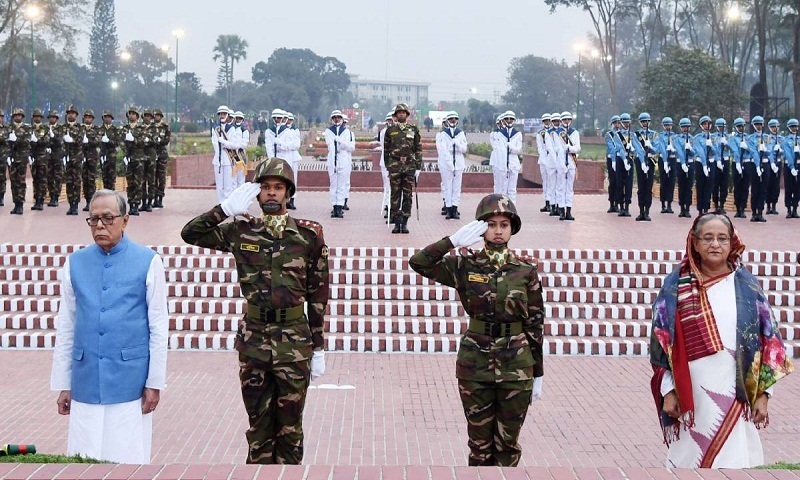 President Abdul Hamid and Prime Minister Sheikh Hasina paid tributes to the martyrs of the Liberation War by placing wreaths at the National Mausoleum at Savar today, marking the the 48th Victory Day. After placing the wreaths, they stood in solemn silence for some time as a mark of profound respect to the memories of the martyrs of the Great War of Liberation in 1971. A smartly turned out contingent drawn from Bangladesh Army, Bangladesh Navy and Bangladesh Air Force presented a state salute on the occasion when bugles played the last post. Chief Justice Syed Mahmud Hossain, Chief Election Commissioner KM Nurul Huda, members of the cabinet, advisers to the prime minister, parliament members, the chiefs of the three services, the mayor of Dhaka South City Corporation, diplomats and high civil and military officials were present on the occasion. Later, Chief Justice Syed Mahmud Hossain, Chief Election Commissioner KM Nurul Huda, Dhaka South City Corporation Mayor Sayeed Khokan and leaders of other political and sociocultural organisations placed wreaths at the National Memorial. The nation is celebrating the 48th Victory Day today marking the most precious day when the country was liberated from the Pakistani occupation forces after a nine-month-long War of Liberation. Forty-seven years back on December 16 in 1971, Bangladesh was born as an independent country under the leadership of the Father of Nation Bangabandhu Sheikh Mujibur Rahman, and for the supreme sacrifice of three million martyrs and the honour of two lakh women.